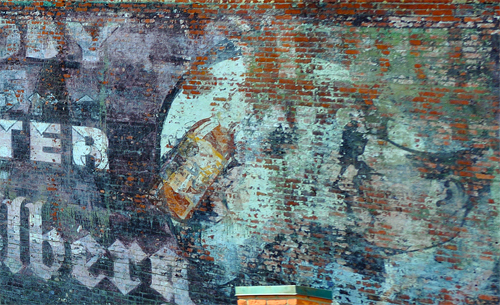 Historic Sign Preservation | Fading Ad Blog HAS MOVED! It seems like such a simple response to a careless mistake. Rather than lament the loss of the 77-year-old hand-painted Alt Heidelberg sign on the side of the Joy Building, just repaint it. “Do we want to preserve the sign or the paint?” wrote one reader of my column on the screw-up by the architects and contractor charged with renovating the building AND preserving historic artifacts such as the sign. 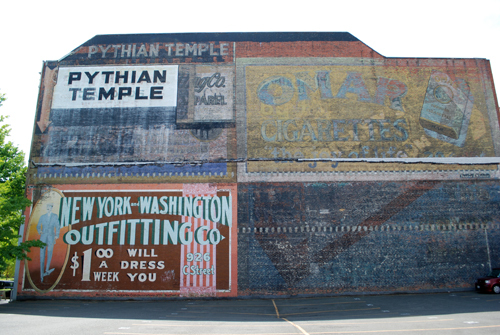 Others pointed to the “New York and Washington Outfitting Co.” sign on the exposed wall of the Knights of Pythias Temple on Broadway as an example of repainting. I’m not a fan of that sign but I was having trouble articulating why. It not only looks new, which it is, it covered the actual-though-faded sign underneath. It is so bright it detracts from the real ghost signs on the walls that were exposed when the Colonial Theater was demolished in 1988. But paint is paint. Besides, most of the prime sign locations downtown were repainted repeatedly as new products, new businesses and new fads came along. So I asked a few people with a special affection for ghost signs, such as New Yorker Frank H. Jump, who features the Student Prince sign on his website Fading Ad Blog (fadingad.wordpress.com/). “I tend to abhor repaints,” Jump wrote back. “It is the decay of a sign I find beautiful. It is a living process in a way. “Signs and vines weather and grow. Reuben McKnight, Tacoma’s historic preservation officer, said city policy is for ghost signs on protected buildings to be preserved. But it has no policy on repainting faded or destroyed signs. The University of Washington Tacoma, owner of the Joy Building, will report to the city landmarks commission June 9 about the loss of the Alt Heidelberg sign. The commission may discuss the idea of repainting at that meeting, McKnight said. Michael Sullivan, a preservation consultant and former city landmarks officer, said he thinks repainting is a bad idea. I agree. The beauty of ghost signs is that they are an apparition. The same image that you can’t see or overlook in certain light appears when the conditions are right. To come upon them is to discover an artifact of a city’s history. And to be able to see multiple layers of advertising is a sort of visual archeological dig. Repainting, therefore, is contrary to all that makes these signs fascinating. Acknowledging that the Student Prince is lost forever makes it an even bigger debacle. But putting an inferior reproduction on the wall would be very cold comfort. One commenter suggested a compromise of sorts. Billyizme said a recent photograph of the sign could be projected onto the wall in the evenings. It would be clear that it isn’t original. But it would be an homage to what was the last stand of an iconic Tacoma brand and mascot. 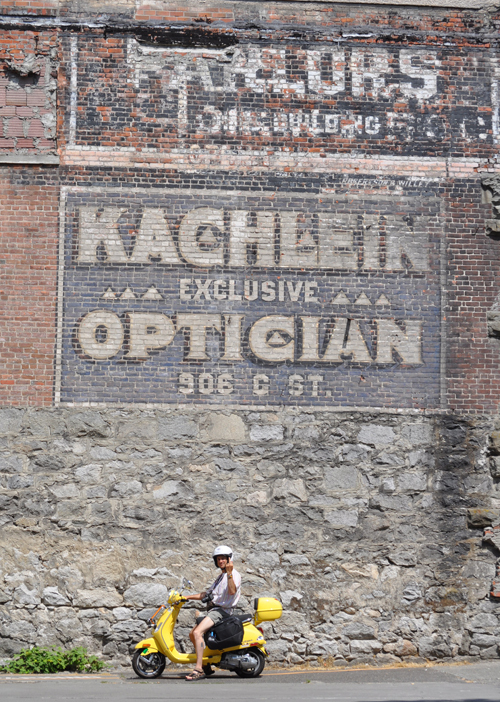 This wall above is opposite the New York – Washington repaint in Tacoma, Washington – a treasure trove of fading ads that now has one less gem.